As mentioned over in britexpatinrio.com, in October I travelled down to the southern Brazilian city of Blumenau to experience the second largest Oktoberfest in the world. Blumenau does not have an airport, but is served by nearby Navagantes and also Florianopolis. The first first is around 1 hour away, the 2nd around 2 hours. If travelling by TAM or Azul, there is a free bus transfer service from Navagantes, which costs R$50 if travelling on GOL. From Florianopolis, there is an inter-city coach available I believe. We were flying by GOL from Rio GIG to Navagantes. The check in experience in Rio was, as I have seen before on GOL, a disaster… Three huge queues, each having 3-5 desks serving them. Except on the queue we were in, they kept taking 2 desks away to serve the running crisis of tens of people not checked in for a flight leaving any minute… And given the handling, I’m sure they were on time. We had to queue over an hour to check in, so I’m glad we arrived early. Having said that, arriving late you basically got priority treatment and pushed to the front of the line, even in front of people on the same flight who had been queuing for an hour. There is a GOL Smiles lounge at GIG, but we literally walked through security and boarding was ready to start a couple of minutes later. 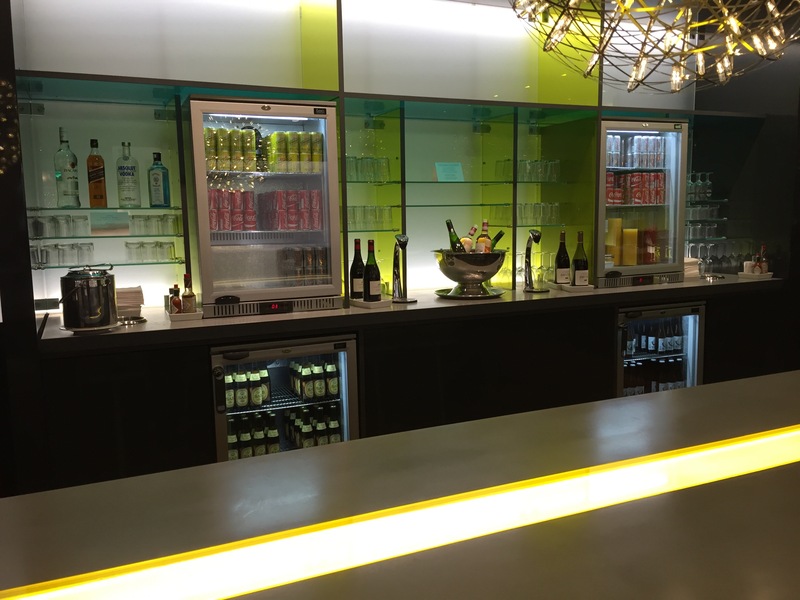 This lounge can be accessed by Priority Pass members, or GOL elites. I had selected GOL’s Comfort+, providing a few extra centimeters of log room. And it is a very comfortable seat with 36cm of leg room, although the width is quite tight I find. GOL use 737s, and I prefer flying on Azul’s Embraers for better seat width. I also prefer their 2+2 seating as opposed to 3+3. But, for a quick <2 hour flight, it is fine. Even the non-seat plus is still ok for such short flights. Navagantes is a very small airport, and we made it through quickly to the waiting bus, which was located on the far right of exiting the terminal. Apparently it is branded ‘International’ airport, but I don’t think it has seen an international flight in a very long time, if ever! The bus was very comfortable, and basically I just slept and woke up in Blumenau! The bus station was only a short 10 minute walk to our hotel, the Accor Ibis Blumenau. It has been a couple of years since I stayed in Ibis. It’s perfectly functional, a queen sized bed, a room with enough space to walk round it. And that’s about it. The service is nothing special, but nothing offensive. We had no problems with an early check in, which I requested in advance, and had our room by 10am. After a quick drop of the bags, we headed out for the day. As this is the peak time, it wasn’t the cheapest (in fact there were rooms for almost the same price as the 5* Accor property we stayed in São Paulo next! ), but it is well located and has a good number of rooms. There are no top level hotels in Blumenau, and this is a fairly decent option I’d say. Breakfast was served until 1030 the next morning, which was a small buffet of fruits, ham, cheese bread and yoghurt. Nothing wow, but enough to start the day. We also experienced the local bus system, which was R$3.50 for a journey including changes (as long as you change in the right place!). Like Rio, drivers still think they are all on a race track! So, if you are thinking of going to Blumenau, it’s easy to get to from Rio or São Paulo, it is fairly cheap to stay, and you can drink a lot of beer while there. We flew in to Navagantes from Rio GIG on the GOL morning flight. This meant us paying R$50 each, which can be paid in cash or by card. The bus transfer left shortly after we arrived, and only had a few passengers on off what was quite a full flight surprisingly. 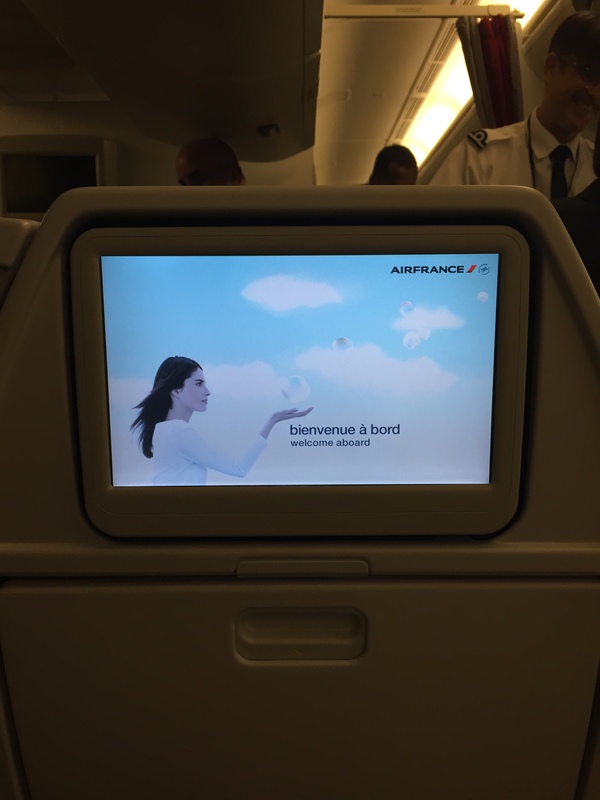 So this last week I had a trip to Paris, flying on Air France. In a previous post, you may have seen I wasn’t necessarily looking forward to the experience traveling on economy on the 777. Outbound I was on an A330, which has a decent 18″ width and 32″ pitch. I’d also secured an exit row seat, giving me near infinite leg room, but unfortunately a non-working TV screen. Thankfully my Kindle and iPad were well stocked anyway. On the way back, I was scheduled to be in economy, in a standard seat. However, I managed to secure an upgrade to Premium Economy for €320. As it was a flight leaving at 11:20pm, I thought it may be worth the expense, and also the change to try a very interest product from AF. I was even interested in business, but the flight was full. AF offers Sky Priority for Premium Economy customers, albeit in a different line to business customers, but still ahead of economy. The AF Premium Economy seat has a hard back that doesn’t recline. That way, your perfectly nice seat doesn’t transform in to a cramped space as soon as the person puts the seat back. 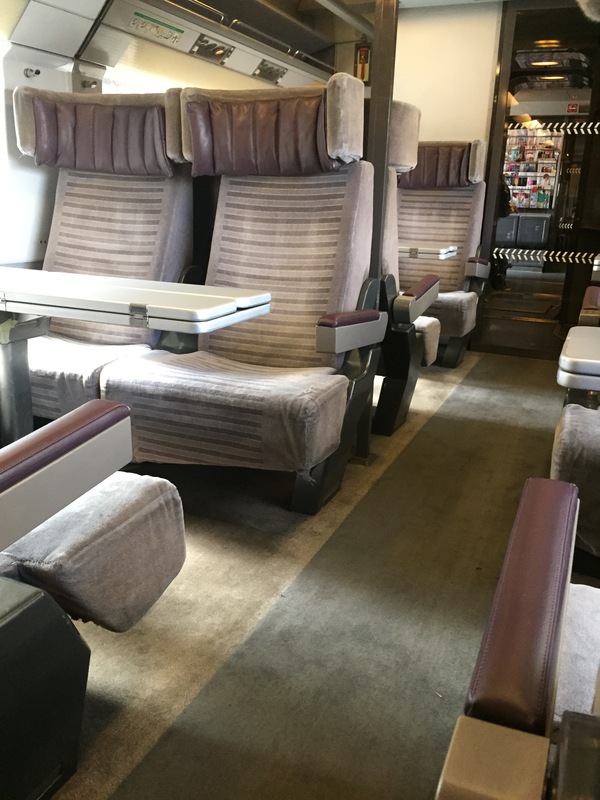 Instead, it is more like a mini-business class seat, where the cushion slides down the seat a bit. On paper, the seat is 19″ width, with a 38″ pitch, and supposedly aa 33 degree recline. Certainly it was nice and wide, far more comfortable than economy. There is also a deployable leg rest and fold out foot rest. It also had a decent size TV screen, and AF’s newer IFE system, with a decent movie selection. There are built in noise cancelling headphones, with some covers to put over the ear pieces, as well as a headphone jack to use your own. The noise cancelling was actually very good, but I ended up using my own headphones as they were wired the wrong way round! My sound was coming out of my seat neighbour’s headphones and vice versa. There is also a universal 220V socket and USB port for at seat power. The tray table folds from the seat in front in two stages. The first half size table is extremely sturdy for a fold down table, and when folded out makes a business class sized table great for working on, and still having room for a drink on the side. Food wise, I had pre-ordered the Italian Menu, which was still delivered to me in PE. However, there is a different menu normally, which had a chicken and vegetarian option available. Proper glass wear and cutlery are given as well, which is always a plus for me. The wine and drinks options are the same as economy, of course including champagne! My decision to upgrade really paid off when we had to divert to São Paulo and spend 4 hours on the tarmac, as Rio GIG was closed due to fog! So this turned it in to a 16 hour flight. My overall thoughts on the flight? I think this is one of the best seats I have travelled in for being able to work. However, for sleeping I did struggle a bit, more so than on my previous flight on BA. For me, when reclined it just wasn’t as comfortable. The amount of recline isn’t much more than in economy, and the way it reclines by sloping down the seat just didn’t make for a comfortable sleeping experience as I’ve had on other Premium Economy flights. Of course it is better than economy, and for a day flight I think would be a really great option instead of business if sleeping wasn’t in your plan! Last weekend I flew a flight I have only done in business or first for the past two years in BA’s WT+, or Premium Economy. Right up until check in I was due to fly in economy, and I wasn’t looking forward to it! However I got upgraded to WT+ for free, most likely due to overbooking as there wasn’t a free seat on the plane! The extra leg room and seat width, greater recline and improved food of WT+ makes a huge difference. 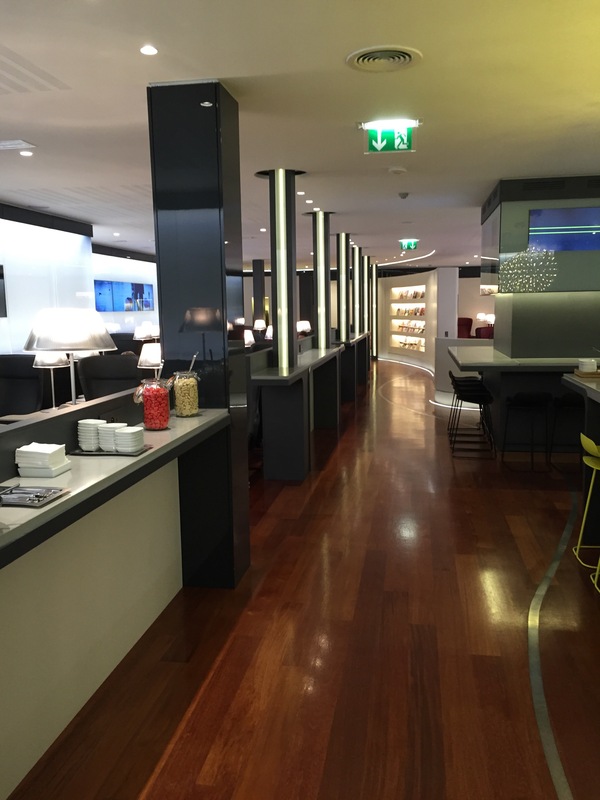 BA normally offer airport upgrades for around £200, and it’s very much worth it in my opinion. Sleeping becomes feasible (comparatively), watching a movie becomes comfortable. Seating is only 8 abreast, which is great. That’s one less than most other airlines. Economy is only 9, again one less than most. The flight leaves at 945pm, so a reasonable enough time for an overnight flight. A hot towel was offered shortly after take off, with a drinks service soon after. The meal service was nearly 2 hours in to the flight however, a bit later than I was hoping for. There are two options from the business class menu available, a tenderloin of beef, or breast of chicken. I had the chicken, and it was edible. I often find chicken options very dry, but it wasn’t as bad as some. The wine however is the same as economy. A reasonably sized screen, the viewing angle gets a bit bad if the person infront reclines their chair and you do not. There’s two USB ports and a multi-country AC socket. The crew were friendly, although I didn’t see them walking up and down very often with a drinks service. As I was trapped in a window seat, I had to use the call button to request some wine, and only managed one cup of coffee with breakfast, as there was no more available… That was disappointing, as in my memory they normally offered a top up! So lately when I’ve looked at prices, WTP has been within $200-300 of business in each direction, and over $400 more than economy. That’s enough to be worth stretching up even further perhaps. However when the price is close, it is an easy decision for me. Indeed. Sometimes it is less! Same goes for the airport upgrades – $325 Or £225. On the return journey I paid for my upgrade. It was a much quieter flight with only 8 of us in the cabin! I had both seats to myself, so more space including two tables to spread out on. The service was also a bit better, but still no drinks trolleys coming through except after take off and with the meals. The meal service itself was great! The beef main meal on the return was excellent – a real surprise! And even the chicken light meal was pretty decent. Just found some bargain (mistake) fares from Brazil to Europe on Alitalia. Still working right now! Will they be honoured? Who knows! But can’t hurt to try. It’s always nice to have a pleasant surprise! I was travelling back from Brusseld”s, and had an hour to kill before my train. 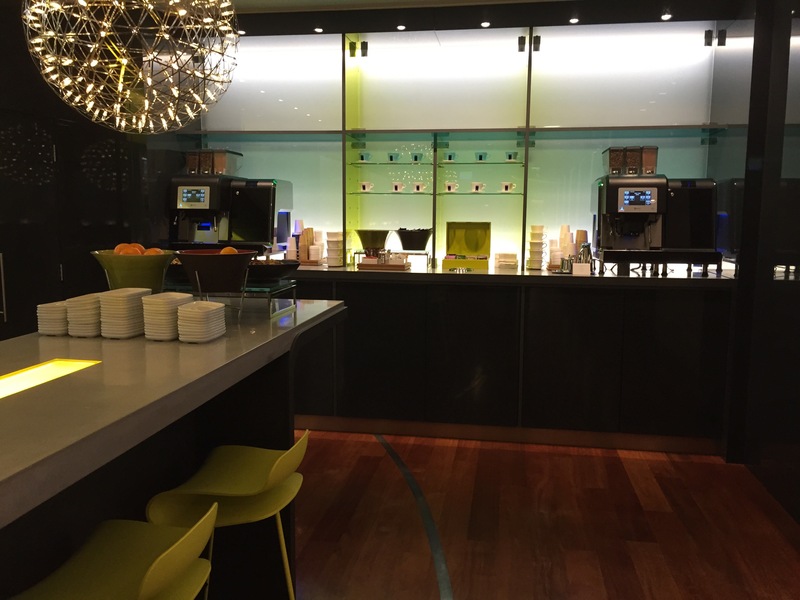 My Amex Platinum card includes a lesser known benefit of access to the Eurostar Business Premier lounges. The lounge was so much better than I was expecting! Certainly better than some airport lounges I use regularly. Comfortable seats, decent coffee, free wifi, multi country and USB charging points at every seat, wine, beer and spirits as well as some snacks. As I was on a morning train, I stuck to the coffee! Stupidly it seems I never took a picture of the seat itself! But this is a great perk to use from Amex! Great place to wait for your journey. I look forward to trying the lounge at St Pancras and Paris in the future. For the train I was travelling in Standard Premier, which can be great value. In this trip it was only £10 more each way, which I will review in a future post. This is just a quick sneak peak at what must be the hotel highlight of my lifetime. My recent trip to New York was a special holiday, and to complete it I had booked the Presidential Suite at the Sofitel New York. First, the hotel itself. Coming along 44th Street it is a discrete affair with a nice entrance way. On arrival a bellhop took our bags for us, and we were shown to the reception area. The lobby of the hotel is a pleasant space. Nothing too showy, a nice smell, some comfy chairs. The concierge desk is by the entrance, and the conceirge staff were really excellent. A classic Sofitel experience I’d say. I’ve never figured out if I like the ‘bonjour’ from the staff – I wish I spoke enough french to see if the french can keep going beyond hello! My only slight disappoint at check in, given we were in the premier suite of the hotel, was that no one offered to show us to the room. We made our own way to the 28th floor. Opening the room to the suite was an amazing experience. I have never stayed anywhere like it, and doubt I will again! The premier suite of the hotel, it was a huge 1200 sq ft, with a living room, office, bedroom, dressing room and 2 bathrooms. But to sum the stay up – amazing!